Food styling by Kymberly Louise, photographed by me. 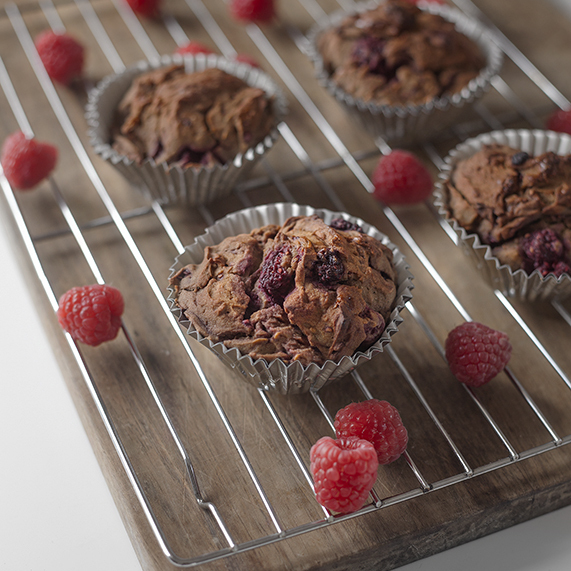 These protein muffins are so tasty, they can't even seem to last a full 24 hours in my house when Beau is around. They happen to be super convenient for breakfast because you can just grab one of these and a piece of fruit and go. In one bowl combine the almond milk, coconut oil, apple cider vinegar, stevia and vanilla bean paste and stir them together, then let it sit for about 5 minutes. In a second bowl place all the other ingredients EXCEPT for the raspberries and combine them together. Stir the milk/oil mix and then pour it into the bowl with the dry ingredient, stir together until the mixture is even. Remove from the oven and allow to cool for 10 minutes or so before eating.